From veteran TV writer Ken Levine's blog, where he gets the lowdown on the episode from writer John Masius. boos for the "butchers from St. Elsewhere." I love that writer Ken Levine, veteran of Cheers, M*A*S*H, Frasier, The Simpsons, and Everybody Loves Raymond to name a few, starts his blog post "St. Elsewhere Goes to Cheers: The Inside Story" by calling it "maybe the strangest cross-promotion in television history." I'd say that's not far-fetched. It's kind of surreal to me that in the finale of season three, Drs. Westphall, Craig and Auschlander decide they could use a belt or two (at the urging of an ailing Katherine Auschlander, due for heart surgery to be performed by Craig in the morning), and drop into a local watering hole that Westphall had heard Ehrlich talking about, Cheers. Rhea Perlman, John Ratzenberger, and George Wendt are the only Cheers cast members involved. (They had wanted Nicholas Colasanto as Coach, but he died.) It's very strange to see St. Elsewhere's handheld tracking shots on the Cheers set. Levine gets the story from St. Elsewhere writer John Masius, titled by Masius, "How St. Elsewhere Came to Cheers: A Revisionist History." He offers some interesting background on how the episode came together. The most interesting bit to me is the one bit of negative feedback they got from Cheers writers Glen and Les Charles, who didn't like the dialogue written for Carla and Cliff. I feel the same way. I've always found their appearances to be weird approximations of Carla and Cliff that just don't quite ring true. However, I've always enjoyed the bit where it turns out that Norm was Dr. Auschlander's accountant, and had previously prepared tax returns that stuck Auschlander with a $17,000 penalty. 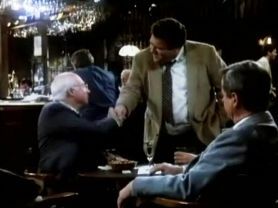 accountant, Norm Peterson (George Wendt). It's not the only crossover between the two shows. There's a Cheers episode from October, 1983, "Little Sister, Don't Cha", where Carla, about to deliver yet another child, announces to the bar that she'll be having her baby at St. Eligius. In this episode of St. Elsewhere, which aired March 27, 1985, Carla reacts with disgust when she finds out the doctors are from St. Eligius, where she had been "forced" to have one of her kids. In preparing this post, I came across several links about St. Elsewhere's crossovers, including this one. There will likely be a post on those in the future. 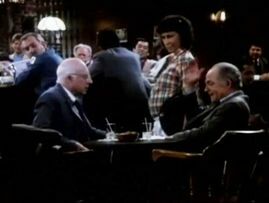 Update, September 20, 2012: YouTube comes through again... here's a twelve-minute clip of the scene from "Cheers". The poster refers to it as "one of the most bizarre crossovers in television history." Update, July 20, 2013: TIME magazine just put this crossover on its list of '10 Classic TV Crossovers'. They used the same YouTube clip I posted here.